Mr. Emerald Dewey Oswald, 72 of Atlanta, Michigan died peacefully surrounded by family at his home on March 18, 2019. He was born in Rust Township, Michigan on September 10, 1946 to the late, William and Geneva (Weaver) Oswald. He served his country proudly in the United States Army during Vietnam. Dewey has resided in Atlanta for the past 35+ years, formerly of Swartz Creek. 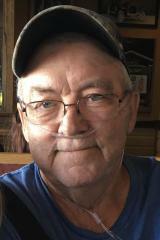 He was born and raised in Hillman and was a member of the Thunderbay Eagles for many years. He married his wife, Tammy (Atkins) Oswald on May 13, 1997 and together the couple celebrated 21 years of marriage before his passing. Dewey loved being social and could frequently be found at Englehart's Salvage and Tow Truck chatting with friends. He loved scratch off tickets, fishing, lending a helping hand to anyone that was in need, and most importantly, spending time with his grandchildren and family. He will be dearly missed. He is survived by his loving wife, Tammy Oswald of Atlanta; son, Todd (Brigget) Oswald of Panama City, Florida; daughters, Karen (Kirk) Brown of Colorado Springs, Colorado; Geneva (Wayne Nelson) Tolles of Sanford; Stephanie (Richard) Hunter of Fountain, Florida; Jessica (Ryan) Radziejewski of Atlanta; 14 grandchildren; three great-grandchildren; and brother, Earl (Bill Sieloff) Oswald of Lewiston. He was preceded in death by his parents, William and Geneva Oswald; and brothers, Gary, Larry, Gerald, David, Ron, Bill, Robert, and Eldon. Funeral services for Mr. Oswald will take place at 1:00 PM on Thursday, March 21, 2019 at Green Funeral Home; Atlanta. Visitation will take place from 11:00 AM until time of service.